Snow Country, Nobel Prize winner Yasunari Kawabata’s first novel, is on the surface a short, simple tale of Shimamura, a wealthy and idle visitor from Tokyo to a mountain resort, and a young girl, Komako who is at the opening of the novel on her way to becoming a geisha (which is in order to help an ill young man to whom she may, or may not, be engaged). Shimamura has taken himself to the mountain resort in order to bring a little more meaning to his life. His comfortable position has left him feeling a little empty and that he needs to bring a little more honesty to his life. His dilettantish approach to life is perhaps characterised by his appointing himself an expert on western dance (specifically ballet) without ever wishing to see it live. He prefers to rely on what he has read of it in books. Initially unable to obtain, as he wished to, the services of a geisha, Shimamura begins a relationship with Komako, who wasn’t a fully-fledged geisha at the start of the novel. The novel follows their struggles they have to develop their relationship. It’s clear that their relationship is doomed never to progress beyond the platonic, no matter how much both of them would wish things to be different. He also admires another of the girls at the resort, Yoko, though he tends to admire her from afar. The novel does present some difficulties for the reader unfamiliar with the minutiae of Japanese culture. It is worth taking a little time to find out a little more about some of what is described in the novel. For example, Komako’s position as a geisha at a mountain resort leaves her with a lower status than that of a geisha in a city such as Tokyo. It seems that, while usually geisha were prized for their artistic accomplishments (some suggest that they would have enjoyed relatively high status – I don’t, unfortunately, know enough of Japanese culture and society to really appreciate to what extent this is true), the “geisha” that worked in resorts such as those depicted in the novel were little more than prostitutes. If, indeed, Komako’s life is destined to peak at a young age with a sharp decline in her fortunes, the impossibility of their relationship is felt all the more by the reader. Their different stations in life (and Shinamura is married with a family) preclude them from developing their relationship. More than this though, Shimamura seems to live in something of a fantasy world. He is unable to commit himself fully to his burgeoning relationship with Komako. This unwillingness to fully engage with life – signalled, perhaps, by his shallow engagement with ballet – is most striking at the end of the novel when there is a fire at the mountain resort. Komako is distraught at the scene unfolding before them. “He saw the figure as a phantasm from an unreal world. That stiff figure, flung out into the air, became soft and pliant. With a doll-like passiveness, and the freedom of the lifeless, it seemed to hold both life and death in abeyance. If Shimamura felt even a flicker of uneasiness, it was lest the head drop, or a knee or a hip bend to disturb that perfectly horizontal line. Some thing of the sort must surely happen; but the body was still horizontal when it stuck the ground. While the first part of this passage is certainly beautiful to read, the last two sentences show the way that he has, and especially as compared to Komako’s reaction, distanced himself from the world around him. 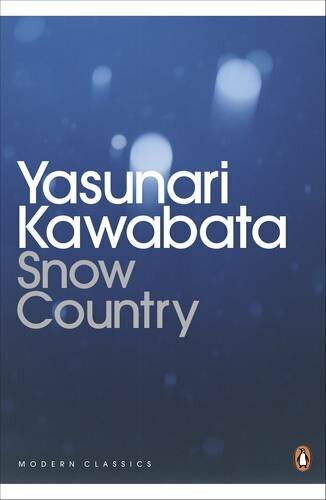 More importantly, Snow Country is indebted to Japanese literary culture. It has been suggested that Kawabata has written a haiku novel. Certainly the spare nature of the prose would seem to bear this out. It is a very short novel and the language used by Kawabata invites invites the reader to read a great deal into the text. The setting of the novel is important, the mountains and the creatures that inhabit it are used to great effect. This, apart from the beauty of the writing, demonstrates some of the problems that Shimamura has in his human relationships. He is unable to give himself fully to the women he meets, whilst Komako, especially, feels comfortable and safe in his presence. She, it is clear, needs more from him. This is contrasted with the way that he sees nature. ‘They are all a little like her, I suppose. Some of the older ones are very attractive, if you had wanted one of them.’ Her eyes were on the ground, and she spoke coldly. The dusky green of the cedars seemed to reflect from her neck. In this, and many other sections like it, we see that though unable to fully engage with other people (such as when they attend the fire at the end of the novel) he does engage with life. It is, however, not other people, rather the world around him. These are the 0nly times that we really see any real feelings from Shimamura. This novel is particularly light on plot. It is concerned with the characters and their inner life (perhaps not character development, Shimamuru doesn’t seem to grow a great deal over the course of the novel). It is notable for the subtlety and beauty of the language that Kawabata uses to depict the relationships of his characters. A gem. This entry was posted in Review and tagged modern classic, novel, Yasanuri Kawabata. Bookmark the permalink.